Personal computer (PC) vendors will remember 2016 as yet another year where their hopes for a market growth recovery failed to materialize. Worldwide PC shipments are forecast to decline by 6.4 percent in 2016, according to the latest worldwide market study by International Data Corporation (IDC). Ironically, this is considered an improvement over an earlier projection for a decline of 7.2 percent in 2016. While the current IDC outlook (subject to change) for 2017 is at -2.1 percent year-over-year decline, the absolute volumes are likely to be slightly higher based on stronger 2016 shipments. The third quarter of 2016 (3Q16) saw a year-over-year decline in shipments of 4.6 percent, more than 2 percentage points ahead of expectations. The 3Q16 market gains were due in part to momentum in the United States, Western Europe, and Japan, and are driven by channel build up in anticipation of component shortages. This inventory accumulation is expected to slightly boost PC shipments into early 2017, but will not carry into later periods. According to the IDC assessment, beyond 2016, the PC shipment outlook has been raised slightly, and continues to trend toward stabilization with modest commercial growth starting in 2018. Commercial notebook shipments were expected to grow during 2016 and throughout the forecast, with a peak at 3.7 percent in 2019. Commercial desktop growth is expected to be effectively flat by 2018, while consumer notebook and desktop shipments are expected to decline slightly throughout the forecast. Competition from media tablets and smartphones continues to ease as those markets mature. 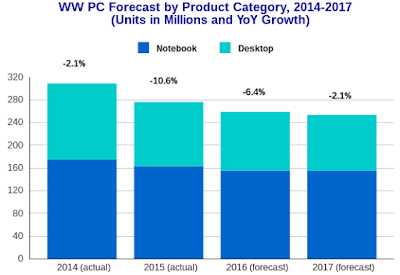 Nevertheless, overlap in usage and converging designs is accelerating the shift in notebooks to ultra-slim and convertible designs, which are now expected to account for almost 63 percent of notebook PC shipments by 2020. Combining detachable tablets with PCs, the market is projected to decline by 3.2 percent in 2016 with small positive growth in later years. Like most industry analysts, IDC truly wants to see the possibility of an upside. "The PC market continues to perform close to expectations," said Loren Loverde, vice president at IDC. "Some volatility in emerging regions is being offset by incremental gains in larger mature markets while the interaction with tablets and phones is stabilizing." Despite continued weakness in the consumer segment, the U.S. PC market is showing some signs of stability in the near future with some sources of optimism for the long haul. Backed by early Windows 10 transitions that could potentially boost commercial PC shipments in the next couple of years, and steady growth of PCaaS (PC as a Service) which should help shorten refresh cycles of commercial systems in the long-term, the overall U.S. PC market sentiment seems to be improving. In the event that Microsoft Windows upgrades fail to lift the market, then there's always the possibility that Google Chromebook demand will once again step into the void that's being created by the ongoing malaise for traditional PC products.